Most of us have never thought of bits – the smallest unit of digital information – as material. Instead we focus on what Erik Stolterman calls “the manifestation” of bits, their appearance in a larger design. Yet just as wood defines a carpenter, so bits define an interaction designer. The similarities end there, however, because bits are different from any other “material” seen before: they can be “kept alive” forever, copied without losing anything and their value increases with greater connectivity. In fact, Stolterman advanced the idea of a “bit pool”—all the bits in the world. How do the unique qualities of bits as material influence thoughtful interaction design? 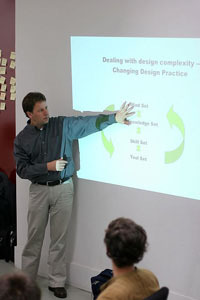 Given the malleable nature of bits, and the ever-growing bit pool, Stolterman believes that the “possible design space” (possible new manifestations of bits in a design) is continually growing. It’s impossible, therefore, for a designer to say a priori how he will design a particular product. At the same time, Stolterman has found that good designers know precisely why they do things a certain way; they can justify their judgments, for example, in a design rationale. Yet because good design is done “in the moment”, scientific approaches (methodologies, frameworks, etc.) can only support – not define – good design. That then prompts the question: what is “good design”? According to Stolterman, judging design is like judging the quality of wine; the answer can only be given for the particular wine. While Stolterman raised as many questions as he answered, he was emphatic on one point: interaction design needs to be taken more seriously. As with architecture, industrial design and other older design disciplines, designing products in what Stolterman calls a “designerly” way requires investment.